We come to the final section of Josef Pieper’s book, Only the Lover Sings, a series of reflections on art and contemplation. Follow the links to read my reflections on Chapter 1, Chapter 2, Chapter 3, and Chapter 4. In my attempt to finish this reflection, I come to realize I need to divide my posts it into two separate reflections. On a special occasion, Pieper presents this series of three talks in the studio of a sculptor. In his first talk, he considers the mythology of the Muses, who inspire remembrance. Remembrance of what? Art evokes a memory in us of paradise, of what it truly means to be human. As there are “large areas of reality in danger of being thus forgotten” the role of the artist is revealed with greater depth. What a massive undertaking! The risk of distraction, losing direction and aim arises. An artist may have great technical skill, but if the artwork lacks substance, “such a product, above all, contains no remembrance nor any power to elicit remembrance, and thus has nothing to do with the Muses.” The artist must shield himself from the numbing of thought and attention that occurs when one takes in the culture and the life on the internet and the endless onslaught of images. A good artist would have to take to the hills or to the sea; to seek solitude as Anne Morrow Lindbergh reminds us, in order to reach that quiet place inside oneself, where one can breathe and create again. We cannot remember in constant noise. We cannot create. We must retreat. The artist will not find his muse without the quiet of his studio, his interior hide-a-way. I think there is devastating art by artists full of despair, but their art reveals a longing for something greater. It is that art which has no longing that hurts us, that I refer to. Sigrid Undset is a beloved author of mine, author of Kristin Lavransdatter and The Master of Hestviken. Before those novels, before her conversion, she wrote a novel called Jenny. I would describe the plot as watching the deterioration of a young woman, and it is devastating. Undset’s insight into the person is remarkable, but at the end I am shaken. I experienced a similar feeling after watching Revolutionary Road, a film about the deterioration of a marriage. Turning from the ugly to the banal. We can recognize such art. If one is sensitive to this sight, or remembrance, he or she will find that art without substance evokes nothing. It leaves us empty, without reaction. It’s nice, but does it leave us with any other feeling? Doesn’t our Lady look bored? I imagine the church goers who feel the same. They simply sit. Nothing stirs them. Some preachers simply speak louder and for a moment might have their attention. But when the preacher’s speech is banal, the viewer settles back into his pew. When in town to interview for graduate school, I wandered around the Smithsonian museum. I happened upon a replica of this piece, The Kiss. I was so struck by it, I paused and took it in. Oughtn’t I be embarrassed by it? But I was not. It was beautiful, striking, and spoke to something deep inside. The passion with which she holds him, the delicacy of his hand which slightly touches her, but will not grasp. The artist, inspired by his muse, whether he realizes it or not, recalls the original innocence and self-gift John Paul II illuminates in the Theology of the Body. I do not think I have ever seen a more beautiful statue, and this photograph hardly does it justice. The Kiss, marble sculpture by Auguste Rodin, 1886; in the Rodin Museum, Paris. I should use a closer comparison to the bored Virgin Mary, now. Below is Bouguereau’s Piet, which you can see in San Francisco’s Legion of Honor. Great art must be view in person. 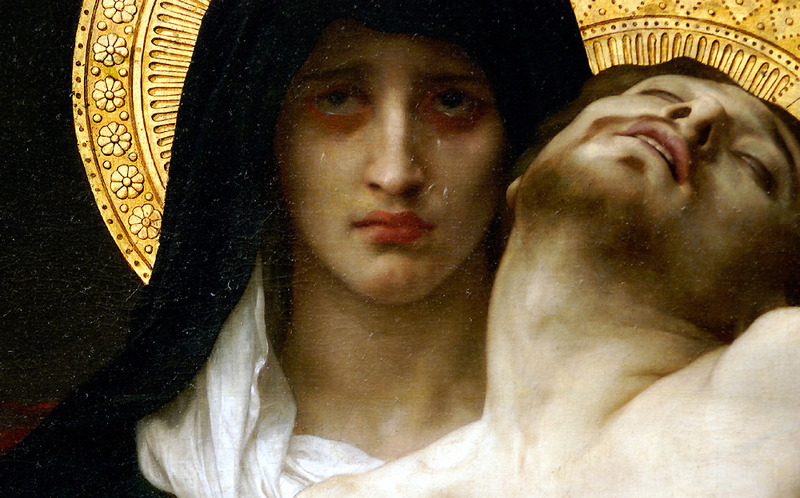 It is only in person that can you can be drawn into the depth of her suffering in her eyes, into the largeness of her suffering by examining the weight of Christ upon her. This is art with substance, which recalls, which invokes.